I love to watch my kids think. It looks like this sometimes and I love it even more when they start talking to themselves to solve a problem. Gayle thinks that this kind of self-talk is important. 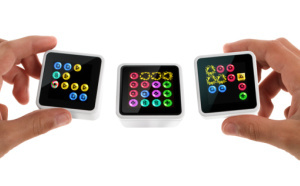 GIVEAWAY: Win both Mastermind and Ultimate Mastermind! 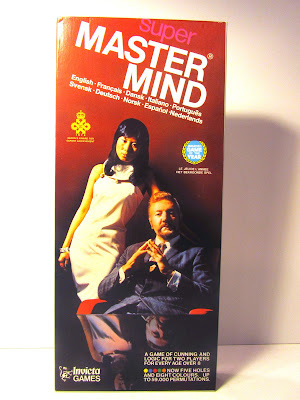 Mastermind, one of my favorite game finds this year just happens to be over forty years old and is an internationally-recognized blockbuster game. 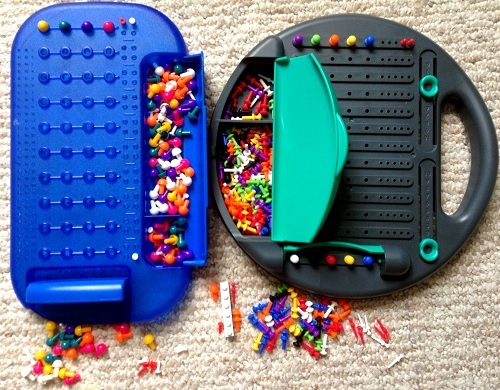 It is such a simple game that has lasted throughout the years. I think the story of its success is not only a testament to creativity but it's also the best evidence that they most exciting games are the ones that exhilarate your mind! Recognize these two? If you do, then like me, you are probably ancient! It's quite humorous to have read that the game Mastermind is really just a tactile version of a paper and pencil game called Bulls and Cows. You play until you get 4 Bulls or until you run out of usable guesses. 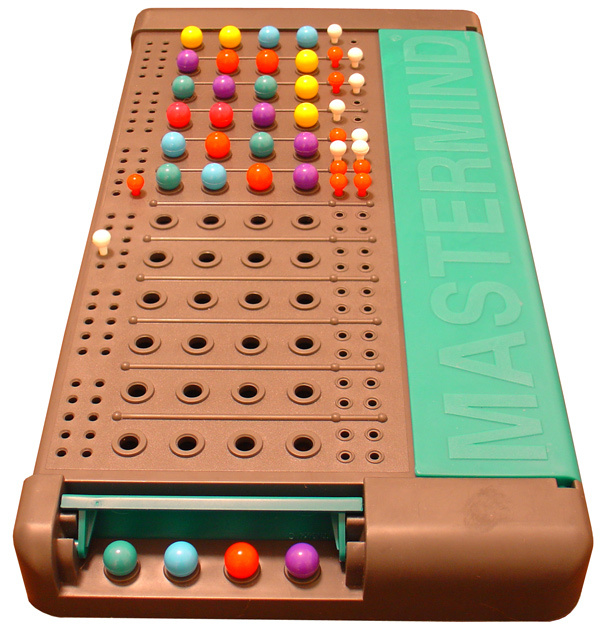 Mastermind is played the same way as Bulls and Cows but with colors. The original (what we have now) version is with 6 colors and like Bulls and Cows, it only uses 4 spaces. So I guess it is slightly easier than the paper and pencil version but if you wanted, you can use less colors and use less spaces. I don't know if Mastermind Junior works this way but if you wanted, you can do it like that. If you think about it, there isn't a "science game" out there, is there? There are kits with powders and test tubes and pretend dinosaur bones and dehydrated owl throw-up but there aren't too many "science games." It's not really something I ever thought about until I talked to Child Psychologist, Gayle Herman about this game. Gayle is an expert on testing children's abilities in a wide variety of areas including spatial reasoning, executive functioning, reading, etc... Lots of people call them IQ tests but Gayle evaluate way more than intellectual abilities. She looks at the whole child and the skills needed to carry out the duties of the life, not just school tests. I thought she was going to tell me about how Mastermind can train a kid to problem solve better and she definitely said that and more. 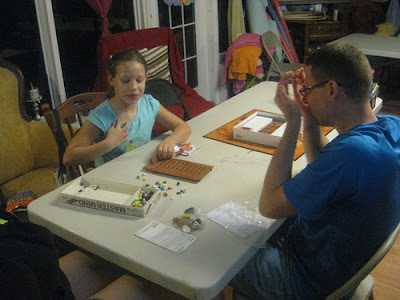 "The game teaches logic, problem solving, strategy, application of algorithms in mathematics, and requires integration of feedback and learning from one’s mistakes," she said. the concepts of experimental design How will I place my pegs? hypothesis testing: What changes might I make to my design to get different results? interpretation of results: Were my assumptions correct? Why or why not? "It teaches players to create well-controlled, systematic, experimental designs because changing too many variables (colors) at once makes it too confusing to draw conclusions," Gayle said. This is really true. The more we played, the more we hypothesized the less we guessed! So many different versions over the years. This image is from Wikimedia. Gayle said that we can learn from "negative data" (the cows or no cows/bulls) as well as positive results (bulls). In a way, this is a very no-frills way for us to train our kids to create strategies as they move ahead. In life, plans are meant to be revised. You can't keep doing the same thing if it doesn't work. Mastermind is a game where you can visually see that you made the same mistake all over again. It's such plain and yet such powerful evidence that doing the wrong thing over and over again is fruitless. There is no judgment, no scorn, no grey area. Players practice problem solving logically, without emotion, like Mr. Spock. I am sure there are apps and electronic versions out there but if you want a lot of learning done in LESS time, I would opt for the real deal. 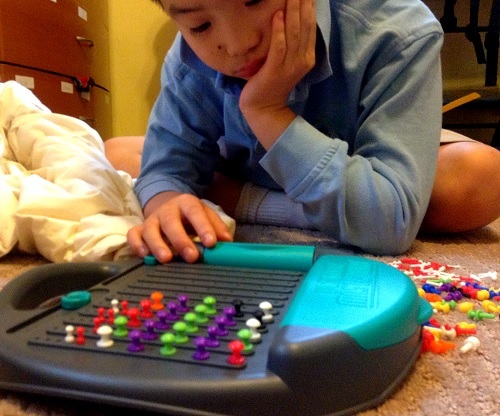 You will have made more sensory input (tactile, visual, propriceptive) when you play the "board" game. The logical aspect of this game is important because during each game, there is only one person doing the hypothesizing (Codebreaker), the Codemaker is just giving the clues and so while it's a one-to-one game, it's not a volley-like game of wit versus wit. Thus, there is less pressure on sensitive egos. After making up a code, the Codemaker's sole job is to give clues and so in a sense, it is quite natural for the Codebreaker to not get riled up against the Codemaker. Maybe this is why my kids just love Mastermind so much. It gets those wheels turning in their head but there is less emotional bruising if you don't get things right. I added the LEGO piece in there so you can see how much work their little fingers will have to do. Both are very fun! It really depends on you. I like having both in my home because my youngest is less overwhelmed by the original version. Peg container shuts tighter but do not let young kids be responsible for it. Number 2 Son’s favorite (he’s six). Four rows are a little too much for him but he is getter there! Box is hard cardboard but you can throw the box away. You can confidently store in on a shelf without having to worry about peg container popping open by accident. Found this photo of Mastermind on the web. I think this shows the very original version but I'm not 100% sure. Either way, it's so simple! Show kids that simple is spectacular. * When they are 8+, most kids will not likely let it roll down by accident but if you are playing with younger kids or kids with slippery fingers (mine) then it is good to stick a little piece of Lego or something to keep it up. It’s important to teach kids to be mindful of this as you can ruin a game if you reveal your code mid-way by accident. **I use elastic bands on my games often even if things generally sufficiently because things do get loose after a while and with kids, you never know... Ever try picking up a bunch of pegs on the carpet? 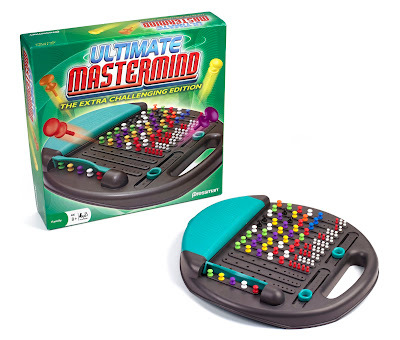 Mastermind Travel Size was part of our Top Travel Games Part 1 story. Gayle says, "Mastermind can even be played in teams with the groups collaborating and talking through their logic and debating strategies aloud." And now try out to win your own package of BOTH Mastermind and Ultimate Mastermind!!! How cool is that? Want to get it on Amazon? Remember to buy it through my links to support Toys are Tools! Disclosure: Toys are Tools was not compensated by the manufacturer for the publication of this review. The reviewed items were provided to Toys are Tools to facilitate a review. Reviews are never promised. The giveaway prize is being offered by the manufacturer. I saw this game, and it's definitely not anything fancy, but my boy could use a lot of work on expressive/describing verbally and in details. This reminds me of "headband" in that sense. We have "Headbandz"...we should actually play that- don't think we ever did- pro a patience thing! I think that this game would be good, although again, not a new concept. I would love to try the "Are you Normal" game. Looks like a great party game! Definitely review Dance Charades next!